Yesterday both traditional and social media were abuzz with the news that evangelist and "America's preacher" Billy Graham had died at the age of 99. Graham was a unique phenomenon, a Christian speaker who could address stadium crowds in the tens of thousands with an intimacy which spoke to individuals. His messages addressed spiritual hunger which could be satisfied in the person of a living, present Christ with whom we can develop a life-changing relationship. At every evangelistic event participants were invited to make a decision for Christ and Decision was the name of the magazine for Graham's organization. Evangelistic "crusades" have largely gone out of fashion, yet the energy of these events created through large attendance, music, and we can hope the stirring of the Holy Spirit, meant that many thousands responded to the invitational moment, the altar call. It's estimated that Graham preached live to 100 million people around the world, and that many again via satellite and television. I never attended a Graham event, although as a child I attended a large Leighton Ford rally with my mother. Ford was a Canadian married to Billy Graham's sister. As a minister I chose not to be involved in crusades which came to communities near where I served, even though pastors were invited to participate. The concern was always that these rallies were manipulative and that one-time conversions were not very United Church. Mind you, mainline denominations aren't exactly success stories these days. I did feel that Graham was a person of deep Christian conviction and integrity. He integrated his crusade stops in the American South during the 50's and 60's and he got on board with President Lyndon Johnston's War on Poverty. Perhaps he greatest weakness was his association with power. He became something of a chaplain to presidents and eventually realized that he had compromised himself in his relationship with Richard Nixon. He made anti-Semitic comments to Nixon for which he later apologized. Despite these blemishes Graham was genuine in his faith. 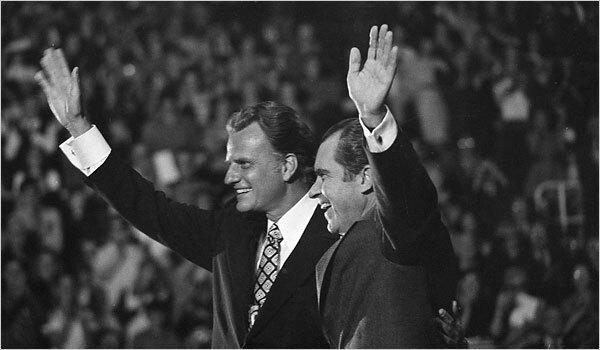 It's interesting that today Billy Graham's son Franklin is a huge supporter of President Donald Trump, arguably a more dangerous and devious president than Nixon -- and that's saying something. Franklin Graham is not a spiritual successor to his father. He can't even stand in his shadow. 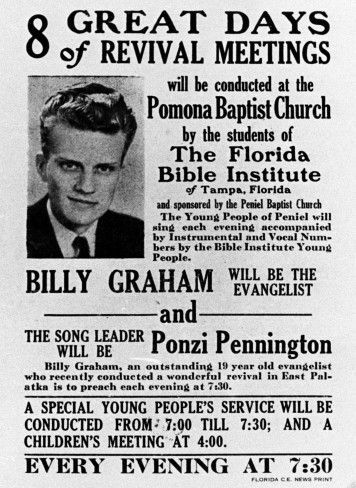 Did you ever attend a Billy Graham crusade? Were you wary or supportive of this sort of event? Does Billy Graham deserve the accolades directed toward him since news of his death?